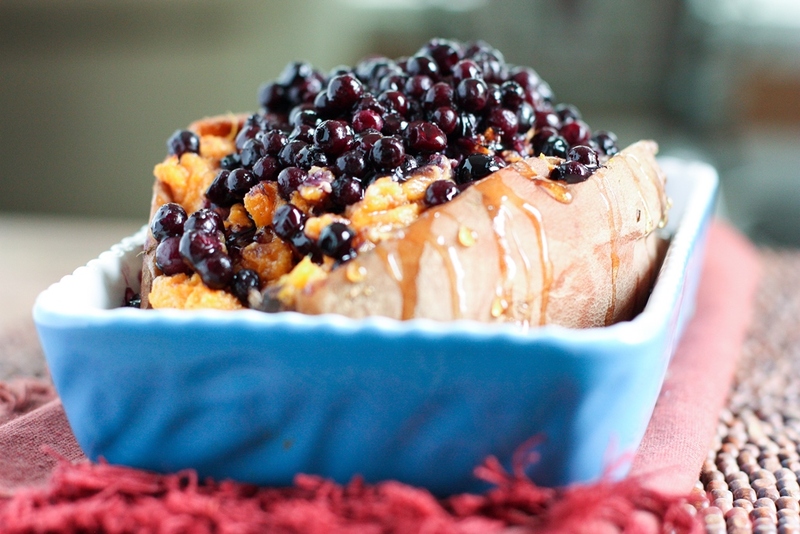 Warm Wild Blueberries drizzled over a creamy twice baked Sweet Potato — it’s heaven on your plate! I don’t consider myself terribly creative in the kitchen. But, sometimes…when I’m tooling around in there, throwing together ingredients, I can surprise myself. This is one of those recipes. I knew what I wanted to do, but I just wasn’t sure how to get there. When it all came together and I took that test bite, I was pretty excited. 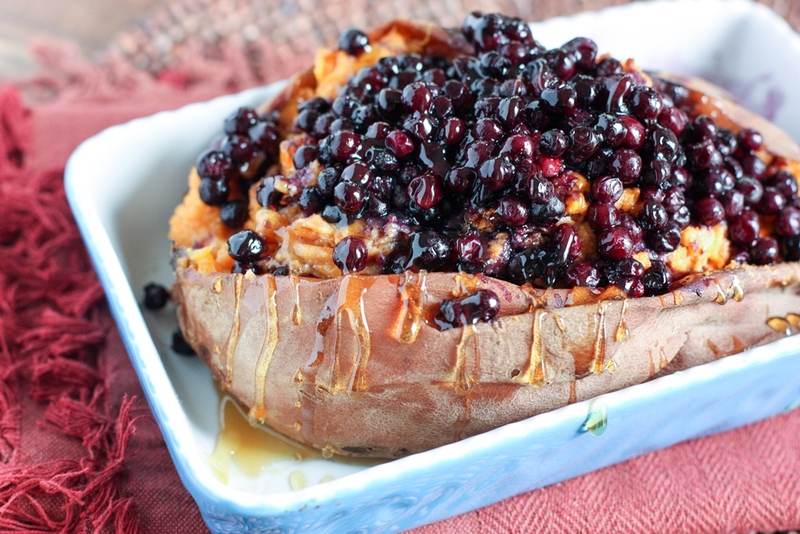 You might be thinking wild blueberries and sweet potato? Let me tell you, it is so good. I started with a big ole, buttery sweet potato that I baked twice. It was actually a ginormous sweet potato, definitely enough for two, maybe three servings. After the first bake, I scooped out the creamy flesh and mixed it with ricotta cheese, a few favorite spices, and a little maple syrup, just for good measure. After piling it back inside this mammoth spud I gave it another quick bake. Once it was toasty and perfect, I served it topped with roasted pecans, warmed wild blueberries, and a drizzle more of real maple syrup. The end result is a magical bite of the perfect amount of sweet and the perfect amount of savory! It’s decadent, yet hearty. It’s fancy, yet rustic. I developed this recipe for the folks over at Wild Blueberries. It was inspired by my husband, who needed a sweet potato intervention. Click here for the recipe and the story behind it. 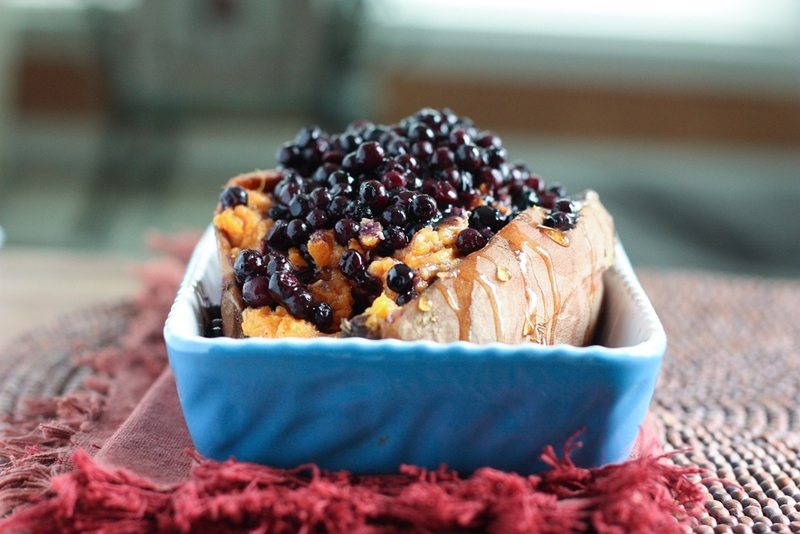 This sweet potato goes well beyond the potato and wild blueberries – ricotta and pecan too?! Yes, please! What a creative combination! I’m totally craving this now! !